Popcorn Super Size with basic party supplies. Regular price $225. This is the top of the line 12/14 oz. kettle popper in the industry. This high capcity machine features an energy-efficient, removable Uni-Maxx® Kettle for easy cleaning, and is mounted in the extra strong cast aluminum twin hanger arms. Produces 250, one-oz. 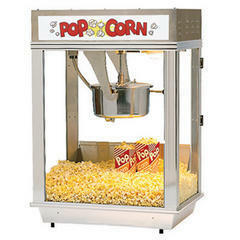 servings per hour which is twice as much as our standard popcorn machine. Best for high output needs such as schools, public events and when you need lots of popcorn really fast.